~Mrs. Mathis' Homeroom~: July Facebook Frenzy! 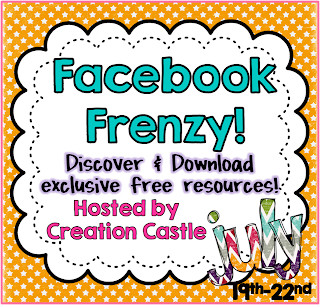 It's time for another Facebook Frenzy, hosted by Creation Castle!! Last month, I offered my Mystery Novel Book Report Case File for FREE, to all my Facebook fans, for 4 days! I got some great feedback from it and just a little over 100 new followers! This month, the theme for the frenzy is "summer". I live in the country, so for me, summer means the sound of frogs and crickets at night. I grew up with those peaceful sounds singing me to sleep as a child, and when I hear them now as an adult, it brings me right back to those nights of summer, trying to sleep in the heat. That's why I decided to create this letter matching game with a frog theme! Psst...to all my primary fans, this one is for YOU! Finally! My best friend is moving to Kindergarten in September and I've been inspired! Grab it between July 19th and July 22nd on my Facebook Fan Page! Just look for this tab! 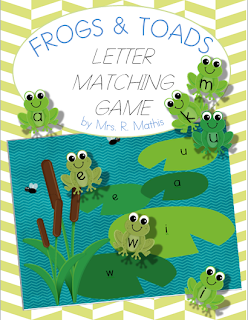 Once you've grabbed your matching game, click on the "Next Stop" button and head on over to the 29 other great Facebook Fan Pages offering freebies! Fans display lists of pages they "love" on their profile in "interests" of their information tab.